We offer passenger service from Rockland, Maine to Matinicus Island, Maine and Criehaven Island. The owner and United States Coast Guard licensed master captain is George Tarkleson of Matinicus. Captain Paul Tarkleson is our other captain. He graduated from Maine Maritime Academy and has worked around the world on many different vessels. me. Because I often have other trips scheduled that day and I have to go with the tides,I reserve the right to cancel your reservation with no refunds given if you are late. Please be on the dock at least 30 minutes before departure time. Remember to allow lots of extra time if you are coming from Portland. Wiscasset traffic can be terrible! A one hour wait is normal and it can be up to 2 hours from around 10 AM to 7 PM in the summer! Also, there is construction in Thomaston which can add 1/2 hour or more to the trip. depart. If a trip is cancelled due to weather all payments will be refunded, or you can have it applied to another trip. If I am cancelling a trip I will try very hard to contact you. If you have any questions about the weather, please call. If I cancel a trip, I usually can take you the next day if the weather improves. 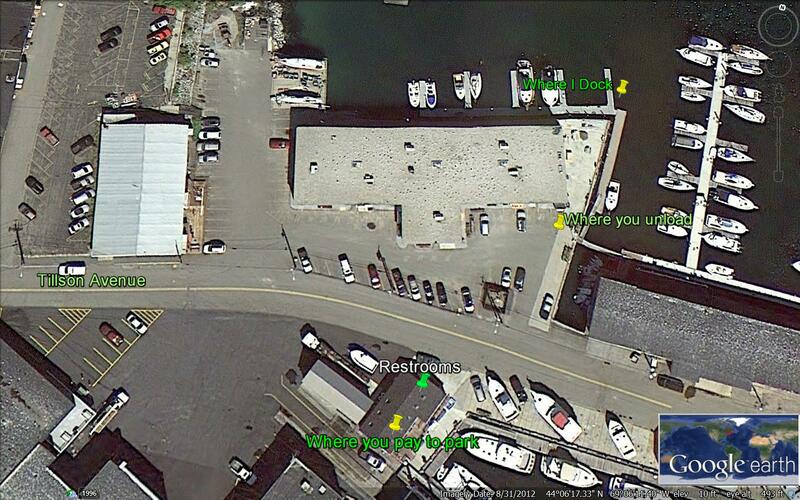 DEPARTURE POINTS - In Rockland, we load and unload at Journey's End Marina. The marina is located at 120 Tillson Avenue, near the end. Parking will be available at the marina for $10 a night. Allow yourself at least one hour to get parked and unloaded. On Matinicus we load and unload at the Steamboat Wharf. PROCEDURE FOR UNLOADING IN ROCKLAND - Pull up to area in front of the main office. Unload gear near top of the ramp, being careful not to block the ramp. Walk across the street to the boating office and pay to park and get directions where to park. Park your vehicle. When I pull in to the dock, you can then carry your gear down to the boat. COMING FROM THE NORTH- (driving south on Route 1 from Belfast, Camden and Rockport ) Follow Route 1 South where it becomes one way traffic on Union Street just after the Dunkin Donuts. At the second traffic light next to Jaret and Cohn Real Estate, turn left onto Route 1 North (Park St). At the next traffic light there will be a Rite Aid Pharmacy on the right: go straight through the light onto Park Drive. The Tradewinds Motel will be on your left. Then the Lighthouse Museum is on the right. Follow Park Drive along as it curves left and go to the stop sign. Hamilton Marine is on your left. Turn right onto Tillson Avenue and after one tenth of a mile you will arrive at the O'Hara Corporation and Journeys End Marina. The unloading area is on the left hand side of the road in front of the 2 story brick office building with a door saying O'Hara Corporation Office. Please see the following photos. COMING FROM THE SOUTH - (driving north on Route 1 from Bath, Wiscasset and Thomaston) At the third traffic light in Rockland there will be a Rite Aid Pharmacy on the right: go straight through the light onto Park Drive. 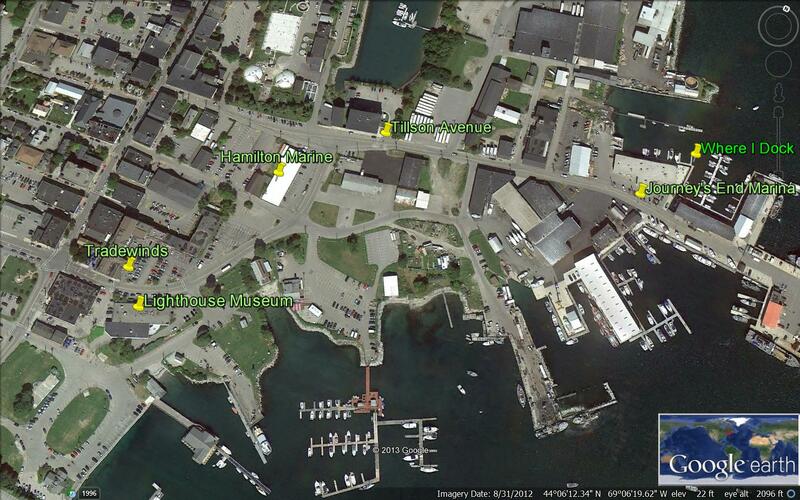 The Tradewinds Motel will be on your left, then the Lighthouse Museum is on the right. Follow Park Drive along as it curves left and go to the stop sign. Hamilton Marine is on your right. Turn right onto Tillson Avenue and after one tenth of a mile you will arrive at the O'Hara Corporation and Journey's End Marine.The unloading area is on the left hand side of the road in front of the two story brick office building with a door saying O'Hara Corporation. Please see the following photos. MAKE SURE TO ADD AT LEAST AN HOUR (or more) TO YOUR TRAVELING TIME IF GOING THROUGH WISCASSET ! !